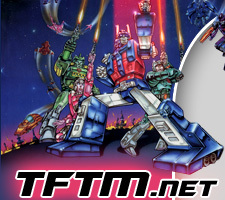 Although many critics have argued that The Transformers: The Movie has a weak story, there are many others who see that TF:TM as an epic tale of Good Versus Evil, of genuine heroism in the face of immense peril, and of redemption. The script has parallels to Arthurian legend and mythological references as well as references to such works as Of Mice and Men. While the story borrows many basic themes from Star Wars, this could be said of MANY sci-fi adventure movies, which only shows that these are very powerful themes. These themes include the power of the individual, that one seemingly unlikely person can make a profound impact upon the outcome of the universe. On the distant planet planet Lithone there lives a race of intelligent robots who live in peace and tranquillity. Their daily activities are interrupted one day, when a giant metal planet with horns and a mouth appears in the sky. As it gets closer, a beam of light fires out of its oriface, tearing away at the planet's surface. Entire cities are crumbled and pulled into the object's gigantic mouth. The two large horns on the "monster planet" act as teeth to pull Lithone closer into its digestive system. Witnessing this apocalyptic catastrophe from Lithone's surface are Kranix and his friend Arblus. They know what the monster is: he is the omnipotent robotic being known as "Unicron." Realizing that their only hope is to evacuate the planet, they rush to their shuttlecraft. As Lithone is crumbled into billions of smaller pieces, their shuttles attempt to escape Unicron's powerful pull. Kranix's shuttle manages to break free and fly away, the only evidence left that there ever was a planet called Lithone. Meanwhile, in the year 2005, another race of robotic beings lives in a quite different lifestyle: one of timeless civil war. A group called the Decepticons have driven their enemies, the Autobots, off of their home planet of Cybertron. Optimus Prime, the leader of the Autobots, plans to reconquer his homeworld by setting up strategic bases on Cybertron's two moons. Despite his troops' eagerness to strike, he awaits the arrival of more energon (their basic fuel) from a shuttle due back from Earth. Little does he know, however, that the Decepticons have already attacked the shuttle and plan to use it to attack the Autobots' fortress on Earth, Autobot City, by slipping past their defense systems. The Decepticons attack Autobot City with great force, and manage to defeat most of the Autobots there. A young Autobot named Hot Rod and his aged friend Kup almost get trapped outside the fortress barrier. From within the city, the Autobots try to use whatever limited weapons they have to drive away the Decepticons. In a desperate plea for help, the Autobots send a distress signal to their leader Optimus Prime. When Optimus Prime arrives, he finds that the Decepticons have penetrated the outer defenses of the city and are advancing deeper within the station. Utilizing all of the courage, strength, and force for which he is famous, Optimus drives directly toward the pack of Decepticons, taking out a good number of their troops. 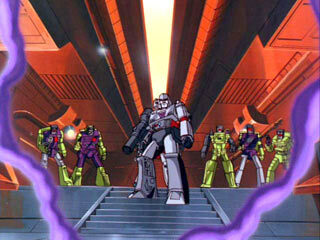 Then he faces his nemesis Megatron, the ruthless leader of the Decepticons. The two timeless foes engage in personal combat, and after a brutal fight, Optimus manages to get Megatron pinned to the ground. Megatron pleads for mercy, while stealthily reaching for a small blaster on the ground out of Prime's range of vision. Hot Rod sees what Megatron is about to do and jumps on top of him. Megatron grabs Hot Rod, uses him as a shield and fires the weapon at Optimus's already damaged area, knocking the Autobot leader down. 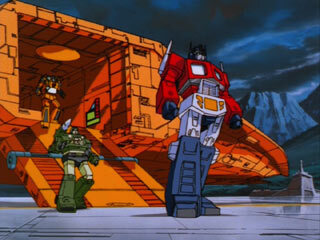 Optimus uses his last ounce of strength to knock Megatron over a cliff, ending the conflict at a standoff. The Decepticons, with their leader down and most of their troops badly damaged, retreat back to Cybertron. 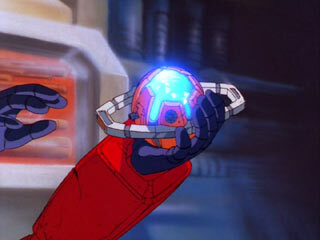 On his death bed, Optimus Prime passes a sacred object known as the "Matrix of Leadership" to his comrade, Ultra Magnus. Optimus foreshadows that "an Autobot shall rise from our ranks and use the power of the Matrix to light our darkest hour." Prime's utters his final words "Until that day... 'Til all are one..." as his colors fade and he deactivates. On the shuttle back to Cybertron, the Decepticons throw overboard their badly damaged warriors in order to lighten their load. In doing so, the Decepticon commander Starscream throws the fallen leader Megatron out into space, in an attempt to usurp his position of command. While floating endlessly through space, the barely functioning Megatron is pulled toward Unicron, who tells him that he has been summoned there "for a purpose." 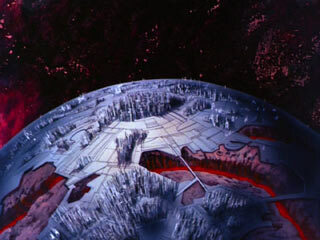 Unicron proposes that Megatron destroy the Matrix for him, in exchange for a new, improved body and new troops. 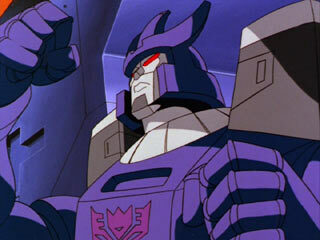 Megatron reluctantly agrees, and is given a new identity, Galvatron. Galvatron, along with his new warriors, Cyclonus, Scourge, and "the Sweeps" return to Cybertron, and reclaim their title among the Decepticon ranks. Galvatron settles a personal score by venting his new destructive power upon his distrustful ally Starscream. The other Decepticons are so impressed with Galvatron's abilities that they willfully join him in his quest for the Matrix. They then go to Earth to try to capture Ultra Magnus and the Autobots. The Autobots flee just in time, and the Decepticons pursue them further into the galaxy. Hot Rod and Kup are separated from the group and crash on the world of the Sharkticons and their masters, the Quintessons. They are put on a trial for no apparent reason, found innocent, and then convicted anyway. Ultra Magnus and the rest of the Autobots crash on a planet called the "Planet of Junk" and before they can repair their craft, they are hunted down by The Sweeps. Ultra Magnus lures the Decepticons away from the group and confronts Galvatron. Instead of trying to defeat his enemy, he tries to open the Matrix to save himself. For some reason, he is unable to open it, and the Sweeps blow him to bits while Galvatron takes the Matrix. The Dinobots, with the help of their new friend Wheelie, save Hot Rod and Kup from the Sharkticons, and convince them to rebel against their cruel enslavers. Our heroes then steal a corkscrew-shaped Quintesson ship, and go to the "Planet of Junk" where they find the other Autobots being hunted by the planet's inhabitants, the Junkions. They learn that their entire language consists of jumbled Earth TV jargon, and establish friendly communication with them. Galvatron takes the Matrix to Unicron, knowing that it can destroy him, in an attempt to defeat his partner-turned-enslaver. Unicron demonstrates his true power by transforming into a giant monster robot. 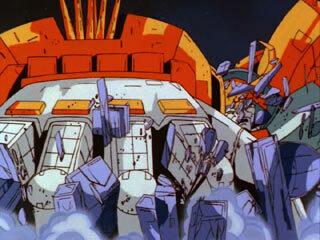 In a display of superior force, Unicron then begins tearing Galvatron's homeworld of Cybertron apart. The Autobots arrive at the scene to find most of the Decepticons on Cybertron fleeing the wrath of Unicron. 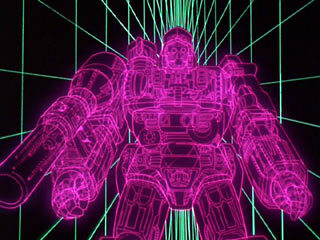 They enter Unicron through his left eye, and Hot Rod is separated from his group. Deep within Unicron, Hot Rod confronts Galvatron, who then begins firing on him. Hot Rod knows that Galvatron possesses much more power than he does, and he runs and hides from his enemy. Realizing that all he needs to do is get the Matrix from Galvatron, Hot Rod transforms into car mode, turns on his high beams, and drives directly toward Galvatron. Galvatron grabs hold of him, and before crushing Hot Rod to death, Hot Rod manages to grab the Matrix away from Galvatron. While holding the Matrix, Hot Rod hears the voice of Optimus Prime telling him he is to become Rodimus Prime, the next Autobot leader. The Matrix gives him a surge of power, and Hot Rod is transformed into a stronger, larger robot. Using his newfound strength, he disposes of Galvatron by throwing him straight out of Unicron. Then, he opens the matrix fully, uttering the words, "now light our darkest hour!" The energy within the Matrix escapes and causes a chain reaction within Unicron, destroying him from within. Rodimus Prime leads the Autobots inside Unicron out of the giant's right eye, leaving Unicron blind. Unicron cries the words: "Destiny! You cannot destroy my destin---aaa!" Then Unicron's head blows off and the rest of his body explodes. 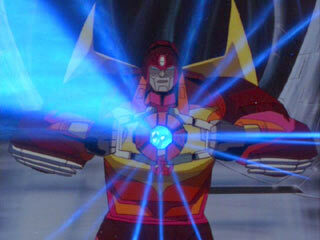 The Autobots reunite on the surface of Cybertron, and Rodimus Prime promises "a new age of peace and happiness." The final shot of the film shows Unicron's head still in orbit of the mostly devastated Cybertron.